Bridal dupatta styles, that became a trailblazer for fusionist brides this year. If you think that it is just a dupatta and it hardly matters. Awww, then you are taken a bridal look very light. Dupatta is the most important part to complete your bridal swag. 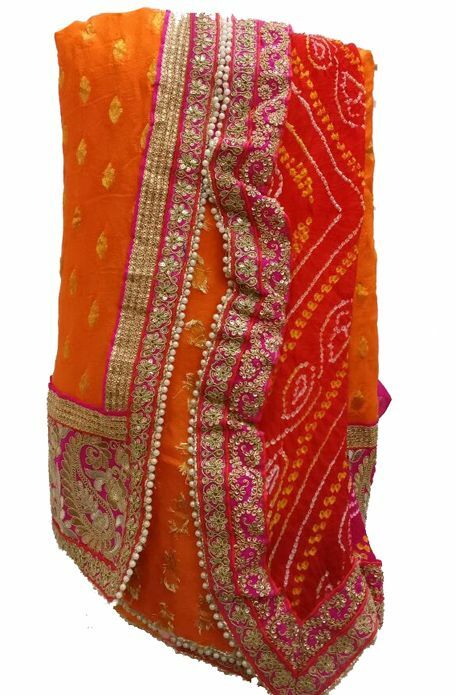 Kadha Dupatta for bride is seen everywhere on wedding photographs, on every festival or in any traditional family rituals. 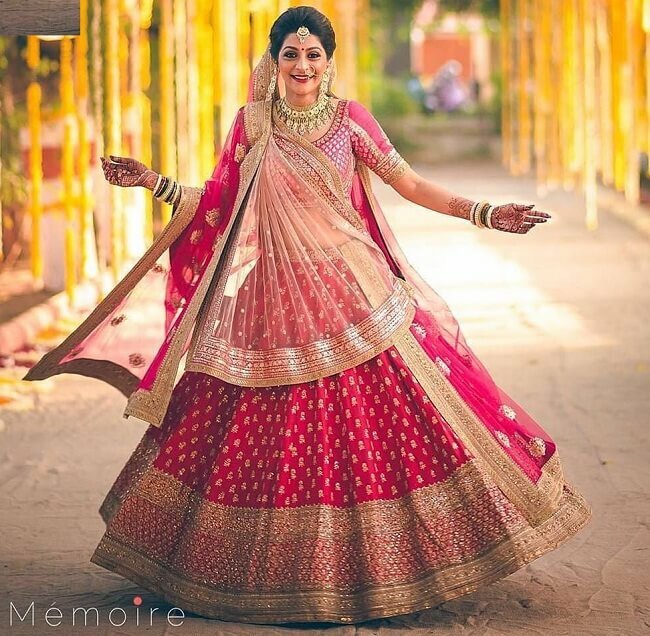 Dreamz wedding planner suggests some trendy bridal dupatta styles, which became trendsetter this year. Every bride wants a unique bridal look which slays the wedding totally. To attain your bridal goals you can also get inspired from these trendy bridal dupatta styles. Deepika Padukone kadha dupatta had Sanskrit shloka ‘Sada Saubhangyavati Bhava’ inscribed on the border with gold thread. It looks so regal on a Padmavati queen. 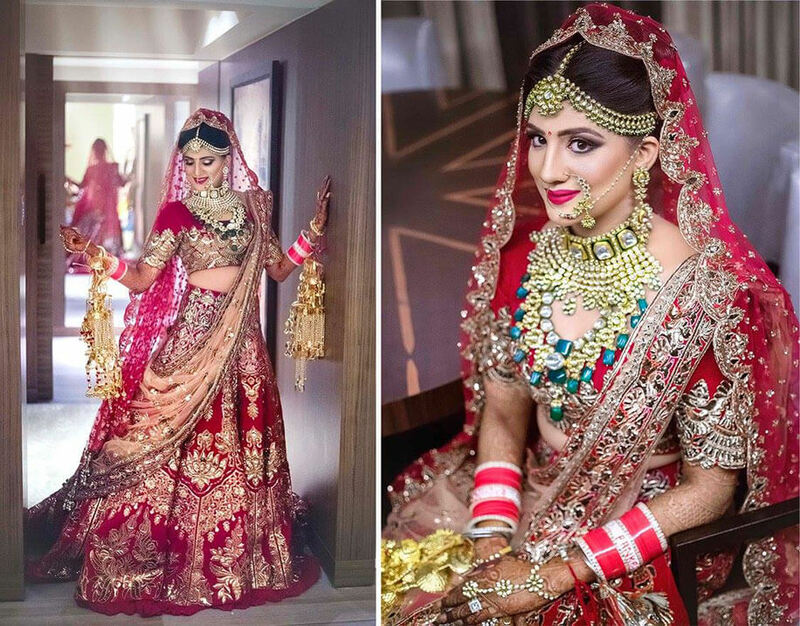 This bridal dupatta style became a trailblazer for the year 2019. 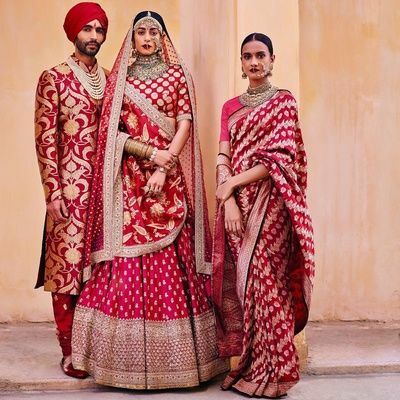 Sabyasachi lit the trend of double dupatta this year for royal Indian brides. It became a swag for all brides this year. 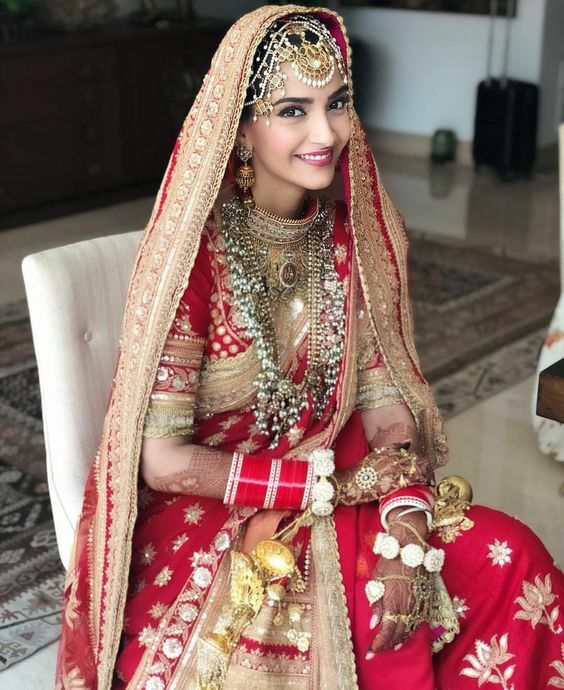 Sonam Kapoor wore double red dupatta in her wedding. 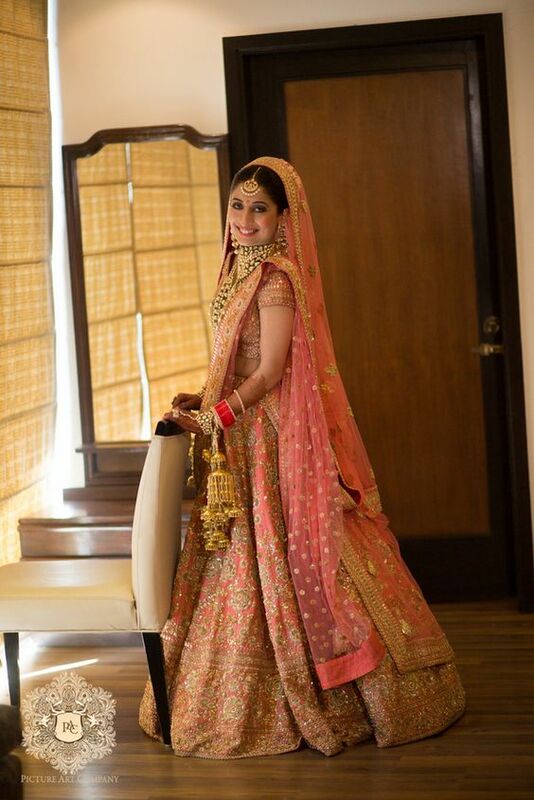 we love this bridal dupatta style for fashionista Indian brides. We are going gaga over this trend. Infuse the color with some experiments. Dark or light, match with border or embroidery of blouse and lehenga. we are very much used to color harmony of bride and groom’s wedding dresses. 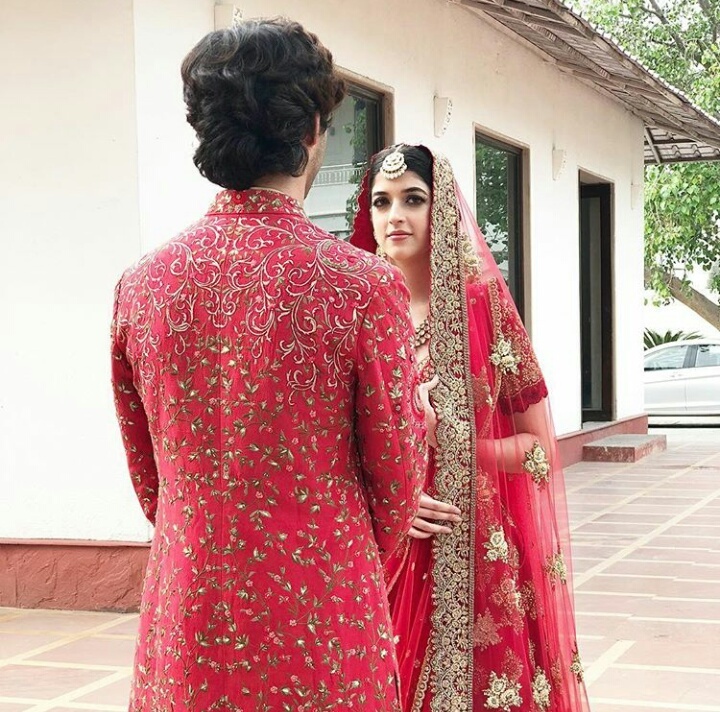 here is something unique pattern harmony in wedding dupattas of both of the Indian wedding couple. 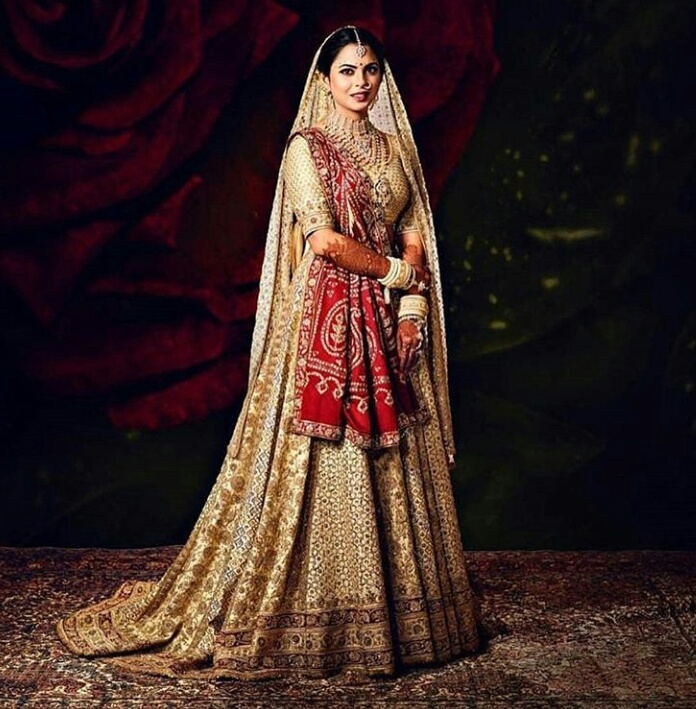 Isha Ambani completes her bridal look by using her mother’s 35 years old ‘wedding saari’. 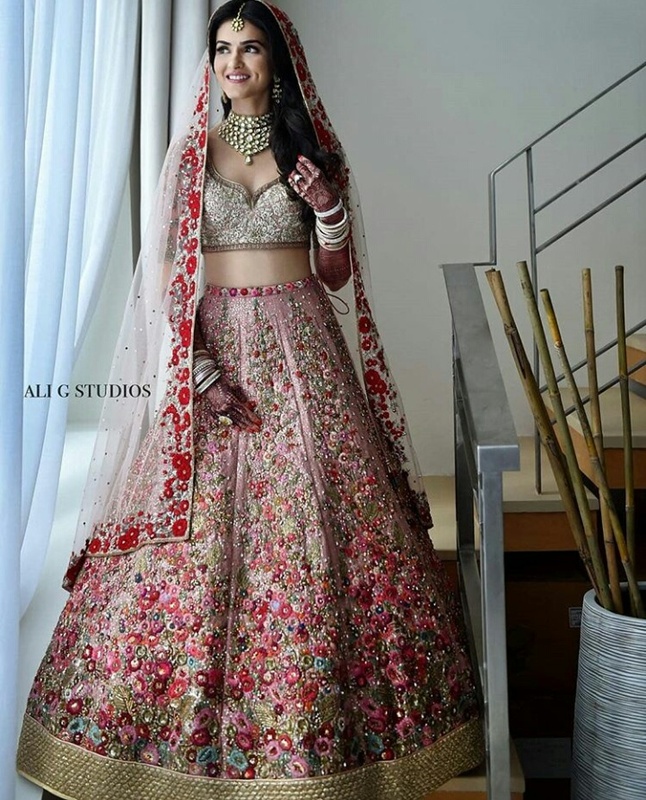 Abu Jaani sandeep Khosla design the wedding lehenga. They gave ethereal look to lehenga by joint a cut of traditional Gujarati sari. Badhni dupattas are very colorful and looks exquisitely graceful on Indian desi Bride. Whatever the latest trend but Bandhni will be forever in Indian Brides’ heart. Gotta Patti trend are back and slaying the bridal swag. Sonam Kapoor uses her mother’s old gotta Patti in her Mehendi Dupatta. A unique saga of tradition and modernity. Tikka ka kaam, Salma Sitara, gotta Patti, badla and Kiran are the traditional motifs of Indian bridal wear. This bridal dupatta couture makes a style statement for Indian bride. 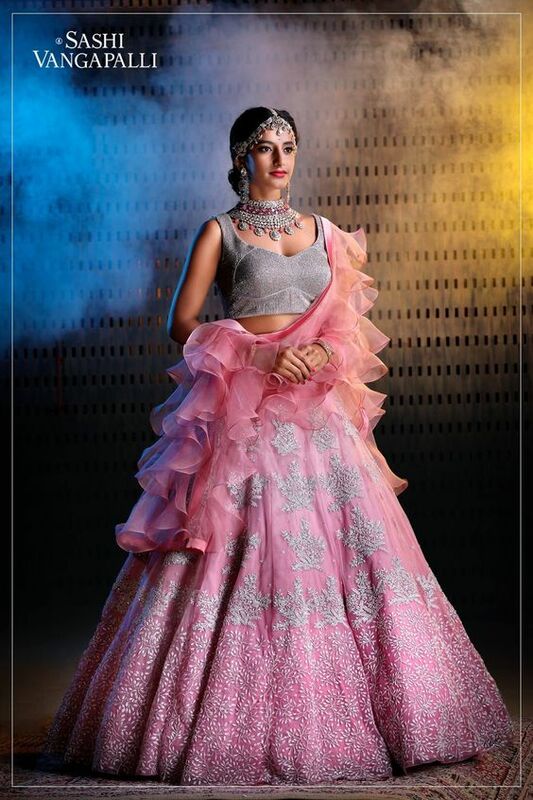 Forget regular dupatta drape and create some drama in your reception and wedding parties. Complete your bridal look by these creative geometrical borders. Curvy, round, symmetric geometrical patterns crafted with gold thread and fine zardozi work. Gorgeous flower pattern border in bridal dupatta, this bridal look fit for glam Indian bride. Floral work are back on lehengas and dupattas. handwoven silk floral patterns shimmer the bridal glow with zardozi silk flower border. Embellished ruffles in dupatta with silhouettes bridal lehengas for Modern Bride. What a stunning bridal dupatta look for wedding reception. Handwoven Banarasi brocade dupatta for a royal Indian bride. This looks so ethnic and traditional. Kanjeevaram golden jari dupattas woven in temple art are also a trendsetter for next year. Gorgeousness is in simplicity. Net dupattas with gorgeous embroidered lace, zari lace, glass embroidery lace with sequence or Mukesh work on net dupatta. Can add more hues by joining double dupatta drapes. Net dupatta recently wore by Priyanka Chopra in her wedding. Zardosi looks royal, especially with semi-precious stones. Sabyasachi creates antiquated zardosi and pearls dupattas for royal Indian bride, color palate is full of maroon. red, pomegranate for authentic Indian Bride. We hope you get many inspiration from this blog post. Dreamz wedding planner always believes in create something unique and special for weddings,NRI Weddings, and destination weddings. We will come with another post full of the newest wedding trend and ideas for the year 2019.